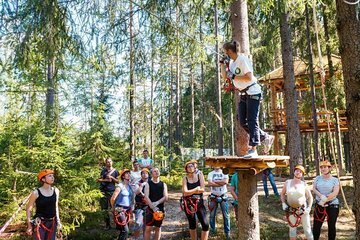 Escape St Petersburg for a day at the region's Greenvald Park Scandinavia, about 31 miles outside the city. Spend your time relaxing on the beach, testing skills at a rope park, visiting a mini-zoo or enjoying a barbecue―there are numerous activities to choose from. Greenvald has a lake for fishing and campgrounds where you can pitch your tent for the night. It's the perfect oasis from urban life and ideal for both families and solo travelers.